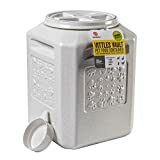 The Vittles Vault Plus 35 is just right for keeping your pet food fresh in that small space with the space efficient square elegantly designed style shape. They are absolutely Airtight to keep your pet food fresh. The easy grip molded handles make it easy to move even when full. Ideal for those mid size 30-40 pound bags of pet food. It has a free measuring cup too.